Good news Sun Cellular subscribers! Your SUN Unlimited Facebook for 3 days is now extended. Like, post, share! Enjoy unlimited Facebook for 3 days for just P20 with your Sun Mobile Internet! 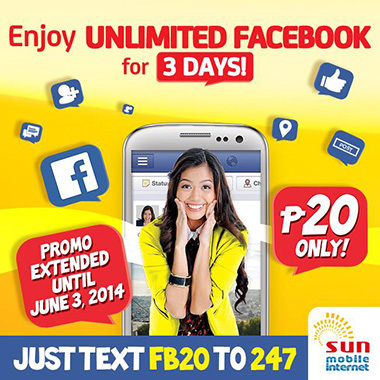 SUN Unlimited Facebook for 3Days is now extended until June 3, 2014! Load up now! You can also check our Unlipromo Facebook Page for the latest feeds and more exciting offers. bakit po ang bagal ng data connection nio d2 sa Montalban RIzal !! i use FB2o !